Inverness CT's Shaun Rooney (left) celebrates his goal with Tom Walsh and Nathan Austin (right). 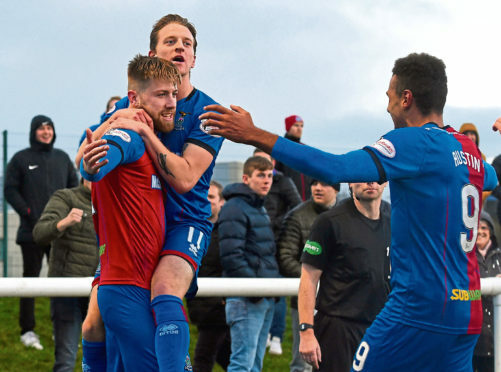 Caley Thistle were made to pay for not making their possession count as they conceded a late equaliser to Edinburgh City in the Scottish Cup. Inverness looked to be easing through to the fourth round with the minimum of fuss at Ainslie Park but a combination of missed chances and an Edinburgh equaliser three minutes from time ensured the two sides will meet again on Tuesday, December 4, at Caledonian Stadium. Inverness rarely moved out of second gear in their trip to the capital but they should have had too much for their lower-league opponents. They dominated the majority of this match but when it came to the final third the quality in front of goal was lacking and it gave the home side hope of a goal – which duly arrived. The Citizens were a potential banana skin for the Highlanders following a strong start to their League 2 season, where they lead Peterhead, but Inverness set a quick tempo from the start. Their first chance came in the seventh minute when Nathan Austin played Liam Polworth in on goal but City goalkeeper Calum Antell did well to block the midfielder’s effort and the home defence scramble the ball clear. Polworth then repaid the compliment by sending Austin clear inside the box but Antell was equal to the striker’s dipping shot, tipping the powerful effort on to his crossbar. When Inverness moved the ball quickly they looked a threat but as the pace slowed it was the home side which came into the game and Mark Ridgers was called into action to save an Allan Smith shot as the confidence in the Edinburgh camp grew. It looked as if a difficult afternoon was unfolding for John Robertson’s side but Caley Jags got the breakthrough they craved seven minutes before the break. For all their bright, attacking play it was a set-piece which broke Edinburgh’s resistance as Polworth’s inswinging delivery found Shaun Rooney at the back post and he beat Antell with a powerful header which the goalkeeper could not keep out. Coll Donaldson should have put the game beyond City early in the second half following a quick free kick which ended with Tom Walsh’s low cross falling at his feet six yards out but the defender fired wide. It was one-way traffic towards the Edinburgh goal and the visitors should have settled this one quickly with Sean Welsh firing over with two efforts, one from the edge of the box and the other a good free kick opportunity from 22 yards. Those missed chances came back to haunt Inverness three minutes from time. It should have been prevented but Craig Thomson’s free kick from near the halfway line was allowed to reach a congested penalty area where no-one in a red and blue shirt was able to deal with it and the ball fell to Blair Henderson who scrambled home the equaliser. Caley Jags showed a sense of urgency in the closing minutes but by then it was too little, too late.